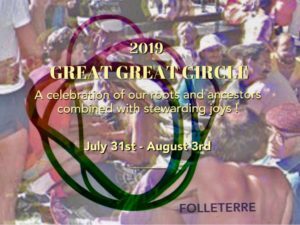 CALL FOR THE 2019 GREAT GREAT CIRCLE : Making Politics a Celebration! is time to harvest and time to celebrate! Lammas, Lughnasadh, the Harvest festivities are calling! What have we sowed? What can we now pick and taste? 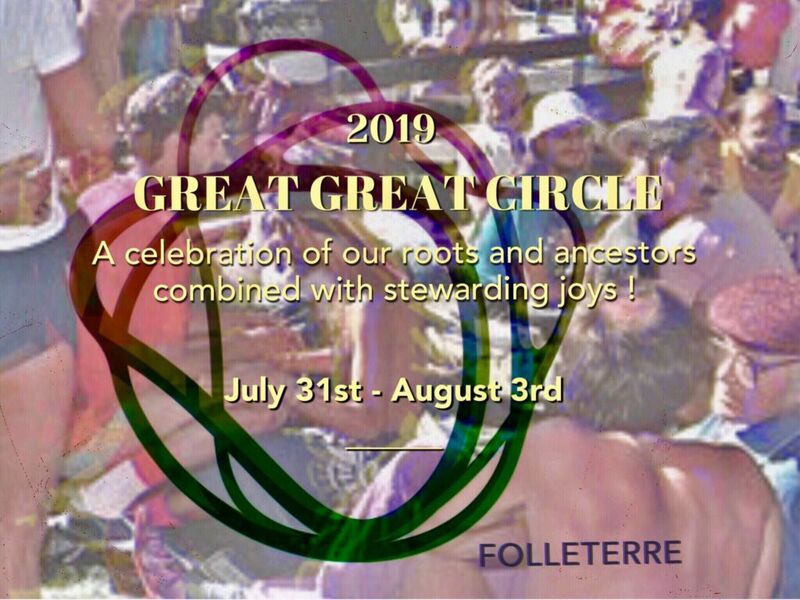 Midsummer is the time when the stewards of Folleterre and the spirits of the Land call on you to gather for the annual Great Circle of Radical Faeries! A time to come together, to listen to each other’s hearts, to sit in circles, to talk our dreams, our visions, our worries, our will. It is time for fae politics, time to hear what the steward circle has done and time to share and prepare for another cycle of the wheel of the year. This Summer we celebrate our 40 years of Radical Faeridom. We remember that in 1979, the first call for a Spiritual Conference for the Radical Faeries was sent out, and the Faeries who answered the call, discovering who they were, planted the seed for radical traditions, re-opened new and oldpaths, and sang and sat and rejoyced! the streets were the first to start it, and that our Freedom and Faerydom owe them so much! This summer we call on you to gather for 5 days of celebrations, of remembrance and of politics! We call you to celebrate our Roots and Ancestors! Our Radical Spirit! Our tremendous Beauty! The Great Circle is the Annual General Assembly of the Sanctuary, it is a unique time for sharing and learning from each other, a moment where ideas and dreams manifest, where visions are shared and deeds are accounted for. We call you to make community together!